North Dartmoor can be wilder and often more daunting than its softer, southern half. 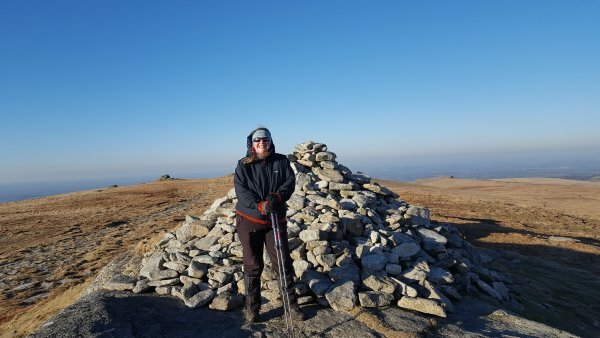 For many people, North Dartmoor (see a definition here) with its miles of bogs, lack of paths and lonely tors represents a challenge they are unwilling to undertake. However, there are areas of North Dartmoor that are suitable for the careful walker and reward with big views (if you are lucky with the weather). High Willhays, at 621 metres, is Dartmoor’s highest point and can be reached (for the most part) on army tracks. Navigation – Take a friendly warning from us, the Dartmoor North Moor tracks are generally wide and easy to follow but many walkers have become confused after taking the wrong one. Take your map and compass for this walk, you will need them to check you are on the right track and on the High Willhays plateau. a) Drive from Okehampton following the ‘camp’ signs past the army camp and over a small bridge. Continue up the hill and park at Rowtor (SX 596 922). b) Head right at the first fork and follow the track around Rowtor, going right at the next fork (we recommend exploring this one on the way back). c) Cross the ford (no bridge) at SX 591 912 then turn left at the top of the track. d) Continue below West Mill Tor then take the right fork before heading to the next ford at SX 586 900 (no bridge). e) Follow the less obvious track west up onto the High Willhays plateau (on any but the clearest day, get your compass out). f) Decide whether you want to first visit the more impressive Yes Tor (head north) SX 580 901 and its windy trig point or the higher High Willhays (head south) SX 580 892 and its summit cairn. The weather comes in quickly on Dartmoor and you may lose visibility up on the plateau. While you are up there, it is worth having a good look at your map and having an escape plan back to the tracks in your head. 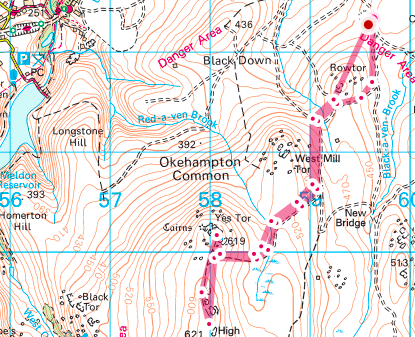 View, print or plan with UK wide access to OS Maps on your computer, tablet or phone. Inspired to walk further or a bit more off the beaten track and discover some more of Dartmoor’s North Moor? We Blondes do navigation training and wild camping workshops too! Have a look at our workshop dates below.